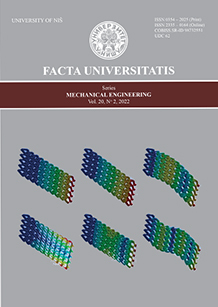 Facta Universitatis, series: Mechanical Engineering (FU Mech Eng) is an open access peer-reviewed international journal published by the University of Niš (Republic of Serbia). High quality, refereed papers are published three times a year. Papers reporting original theoretical and/or practice oriented research or extended versions of the already published conference papers are all welcome. The scope of the journal covers the whole spectrum of Mechanical Engineering. Papers for publication are selected through peer reviewing to ensure originality, relevance, and readability. In doing that, the objective is not only to keep the high quality of published papers, but also to provide a timely, thorough and balanced review process. Aims and Scope: The principal aim of the journal is to bring together the latest research and development in various fields of Mechanical Engineering. We would like to higlight that papers should refer to Focus and Scope, but they are not limited to. Rapid publication: Online submission system, electronic peer review and production make the process of publishing your article very simple and efficient. Usually, it takes less than 2 months from the moment of your submission to a response generated by the reviewing system. If your paper is accepted, we will try to publish it in the upcoming issue. FU Mech Eng publishes research articles, reviews, case studies. Thematic/special issues include an editorial. Research articles must contain an adequate overview of the representative work in the field including up-to-date references, clear statement of the novelty in the presented research, suitable theoretical background, one or more case studies to demonstrate and discuss the presented ideas and, finally, conclusions. The articles are usually up to 12 pages long. However, longer articles may be accepted with appropriate reasoning. Authors are requested to follow the FU Mech Eng guidelines in preparing their manuscripts as well as use the article template that is available here. If the authors provide a previously published conference submission, Editors will check the submission to determine whether there has been sufficient new material added to warrant publication in the Journal. The FU Mech Eng guidelines require such submissions to contain a significant amount of new material, that is, material that has not been published elsewhere. New results are desired but not necessarily required; however, the submission should contain expansions of key ideas, examples, elaborations, etc. of the conference submission. The paper submitted to the journal should differ from the previously published material by at least 40 percent. The ONLINE FIRST section of FU Mech Eng lists the papers accepted for publication and copy edited but not yet assigned to an issue. In September 2016, scientific journal Facta Universitatis, Series: Mechanical Engineering has been included into the newly launched ESCI (Emerging Sources Citation Index) of Clarivate Analytics (formerly Thomson Reuters).